TurtleBot2 now in stock at Active8 Robots! We’re proud to announce that we’ve teamed up with Yujin Robot and the Open Source Robotics Foundation to become the UK distributor for TurtleBot2. Many of our customers come to us looking for a low cost, easy to use robotic platform to learn and teach ROS with and TurtleBot2 is the perfect solution for this. TurtleBot2 can be built quickly, has great value components, embedded sensors and with an impressive range of mounting options it is extremely versatile for a range of applications. Greater autonomy: the Kobuki base is already better than its predecessor. It has been greatly improved by the integration of additional external batteries to power the laptop and the mobile base. As such the autonomy of TurtleBot2 has been extended to 2-3 hours! Kobuki is able to bring more power to your additional sensors and manipulators. A docking station: there is no need to stop and plug your robot in to charge. Using this self-charging dock, your robot will be able to recharge its batteries (and then the laptop) which makes possible continuous operation of the robot. 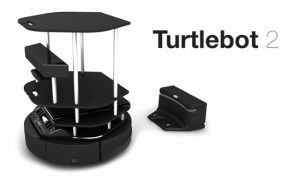 You’ll be able to leave TurtleBot2 on 24/7, which enables true remote access for robot sharing, telepresence or unsupervised autonomy. More accurate wheel encoders: odometry gains in precision thanks to the encoders of the Kobuki which are extremely accurate (11.7 ticks/mm, 25718.16 ticks/revolution). Larger wheels that allow the robot to pass obstacles up to 12mm. There are already a great range of existing TurtleBot projects including TurtleBot Laser Tag, human follower TurtleBot, iPad wireless control and building an arm for your TurtleBot. Want to find out more about TurtleBot2? Contact us to find out more about TurtleBot2 and how it can help you with your next project.